Clothes dryers evaporate the water from wet clothing by blowing hot air past them while they tumble inside a spinning drum. Heat is provided by an electrical heating element or gas burner. Some heavy garment loads can contain more than a gallon of water which, during the drying process, will become airborne water vapor and leave the dryer and home through an exhaust duct (more commonly known as a dryer vent). It should be connected. The connection is usually behind the dryer but may be beneath it. Look carefully to make sure it’s actually connected. It should not be restricted. Dryer vents are often made from flexible plastic or metal duct, which may be easily kinked or crushed where they exit the dryer and enter the wall or floor. This is often a problem since dryers tend to be tucked away into small areas with little room to work. Vent elbows are available which is designed to turn 90° in a limited space without restricting the flow of exhaust air. Restrictions should be noted in the inspector's report. Airflow restrictions are a potential fire hazard. 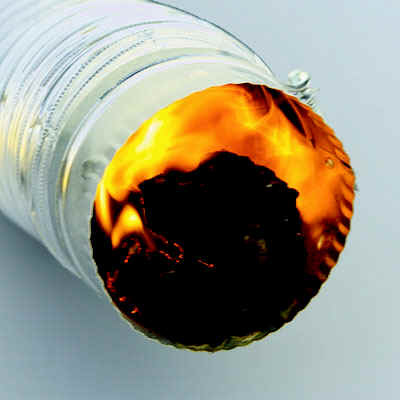 One of the reasons that restrictions are a potential fire hazard is that, along with water vapor evaporated out of wet clothes, the exhaust stream carries lint – highly flammable particles of clothing made of cotton and polyester. Lint can accumulate in an exhaust duct, reducing the dryer’s ability to expel heated water vapor, which then accumulates as heat energy within the machine. As the dryer overheats, mechanical failures can trigger sparks, which can cause lint trapped in the dryer vent to burst into flames. This condition can cause the whole house to burst into flames. Fires generally originate within the dryer but spread by escaping through the ventilation duct, incinerating trapped lint, and following its path into the building wall. InterNACHI believes that house fires caused by dryers are far more common than are generally believed, a fact that can be appreciated upon reviewing statistics from the National Fire Protection Agency. Fires caused by dryers in 2005 were responsible for approximately 13,775 house fires, 418 injuries, 15 deaths, and $196 million in property damage. Most of these incidents occur in residences and are the result of improper lint cleanup and maintenance. Fortunately, these fires are very easy to prevent. Exhaust ducts shall be constructed of minimum 0.016-inch-thick (0.4 mm) rigid metal ducts, having smooth interior surfaces, with joints running in the direction of air flow. Exhaust ducts shall not be connected with sheet-metal screws or fastening means which extend into the duct. This means that the flexible, ribbed vents used in the past should no longer be used. They should be noted as a potential fire hazard if observed during an inspection. The maximum length of a clothes dryer exhaust duct shall not exceed 25 feet (7,620 mm) from the dryer location to the wall or roof termination. The maximum length of the duct shall be reduced 2.5 feet (762 mm) for each 45-degree (0.8 rad) bend, and 5 feet (1,524 mm) for each 90-degree (1.6 rad) bend. The maximum length of the exhaust duct does not include the transition duct. This means that vents should also be as straight as possible and cannot be longer than 25 feet. Any 90-degree turns in the vent reduce this 25-foot number by 5 feet, since these turns restrict airflow. The IRC will defer to the manufacturer’s instruction, so if the manufacturer’s recommendation permits a longer exhaust vent, that’s acceptable. An inspector probably won’t have the manufacturer’s recommendations, and even if they do, confirming compliance with them exceeds the scope of a General Home Inspection. The IRC will allow large radius bends to be installed to reduce restrictions at turns, but confirming compliance requires performing engineering calculation in accordance with the ASHRAE Fundamentals Handbook, which definitely lies beyond the scope of a General Home Inspection. Exhaust ducts shall terminate on the outside of the building or shall be in accordance with the dryer manufacturer’s installation instructions. Exhaust ducts shall terminate not less than 3 feet (914 mm) in any direction from openings into buildings. Exhaust duct terminations shall be equipped with a backdraft damper. Screens shall not be installed at the duct termination. 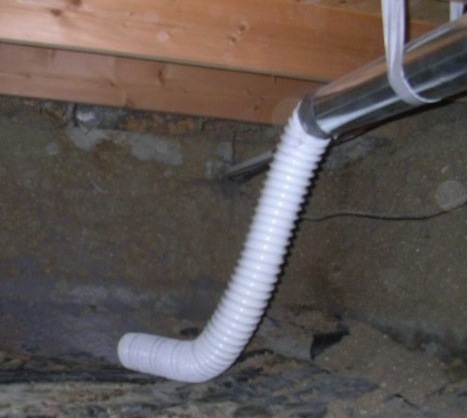 Inspectors will see many dryer vents terminate in crawlspaces or attics where they deposit moisture, which can encourage the growth of mold, wood decay, or other material problems. Sometimes they will terminate just beneath attic ventilators. This is a defective installation. They must terminate at the exterior and away from a door or window. Also, screens may be present at the duct termination and can accumulate lint and should be noted as improper. The diameter of the exhaust duct shall be as required by the clothes dryer’s listing and the manufacturer’s installation instructions. Look for the exhaust duct size on the data plate. Transition ducts shall not be concealed within construction. Flexible transition ducts used to connect the dryer to the exhaust duct system shall be limited to single lengths not to exceed 8 feet (2438 mm), and shall be listed and labeled in accordance with UL 2158A. Exhaust ducts shall be supported at intervals not to exceed 12 feet (3,658 mm) and shall be secured in place. The insert end of the duct shall extend into the adjoining duct or fitting in the direction of airflow. Exhaust duct joints shall be sealed in accordance with Section M1601.4.1 and shall be mechanically fastened. Ducts shall not be joined with screws or similar fasteners that protrude more than 1/8-inch (3.2 mm) into the inside of the duct. In general, an inspector will not know specific manufacturer’s recommendations or local applicable codes and will not be able to confirm the dryer vent's compliance to them, but will be able to point out issues that may need to be corrected.